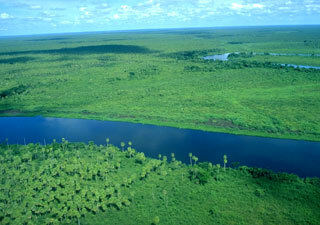 The Pantanal Boliviano comprises of 3,189,888iha and consists of three units. They are located in the eastern part of the department of Santa Cruz. Two important towns located on the edge of the site are San Matías in the northeastern corner of the site, and Puerto Suárez, southeast of the site. The eastern site boundary forms the border with Brazil. The Bolivian Pantanal contains the complete range of plant communities typical of wetlands in the Brazil-Paraná biogeographic region, with additional influences from the Chaco region. Rare reptiles such as Boa constrictor and Caiman yacare they are endangered. Other large mammal species occurring here, like the marsh deer, ant-eaters, tapir as well as cats (Panthera onca) are also in danger. The site supports a high diversity of animals, including at least 197 fish, more than 70 reptile, more than 300 bird and more than 50 large mammal species. The Bolivian Pantanal is a highly complex and seasonally dynamic mosaic of lakes, pools, swamps, rivers, meanders, permanently and seasonally flooded grasslands, permanently and seasonally flooded forests, as well as palm groves, dry forests and shrub lands. It forms part of a huge depression that accumulates the runoff from most of the upper basin of the Paraguay River. The site is drained by a complex water system, which in turn feeds into the two main tributaries of the Paraguay River in Bolivia, the Río Candelaria and the Río Otuquis. The water flowing into the Bolivian Pantanal is of good quality. The site is important for flood regulation in a large part of eastern Bolivia. It influences the regional climate and retains sediment and nutrients necessary for the maintenance of the food chain. There is a dry period during the winter and a rainy season that lasts from November to March. Several large bodies of water, the Cáceres, Gaiba, Mandioré and Uberaba lakes, are permanent. Most of the site, however, is flooded only seasonally. WWF Bolivia has formed a partnership with the people of SERNAP (Servicio Nacional de areas protegidas) in Puerto Suarez and is trying to build up a whole network with politicans, farmers and the local governement in order to integrate all the people and their interests in the future development of the national park. WWF helps in the development and study for an urgently needed river basin managment plan, and their studies are of a high professional standard. They also support the education of local children with a muppet show with endangered species that tell the story of polluted water and how they will be affected. The whole area is in danger because of plans to start open pit iron mining. Large areas at and around the site will be logged to provide firewood to the mining industry. The processing of precious ores requires the use of toxic heavy metals such as mercury. The possible improvement of the Hidrovía Paraguay-Paraná in Brazil and the proposed elimination of obstacles to navigation in Bolivia would imply changes in the Paraguay riverbed, which would result in a decrease of area, depth and duration of flooding throughout the Pantanal. Immediate threats come from local and foreign poachers who invade the protected area for game.